Attorney General Jeff Sessions announced a new transnational organised-crime task force on Monday. It’s part of the Trump administration’s crackdown on crime that has been one of its priorities since President Donald Trump took office. The Justice Department, following Trump’s lead, has intensified its efforts against the transnational gang MS-13, which started in the US and is now based in Central America. Sessions designated the group a priority for the department’s Organised Crime Drug Enforcement Task Forces. Subcommittees within the new task force will focus on five groups. Attorney General Jeff Sessions on Monday announced a new task force focusing on transnational organised crime, furthering a crackdown on crime that he said had been a Trump administration priority since Day 1. “The same day I was sworn in as attorney general, President Trump ordered me to disrupt and dismantle these groups,” Sessions said in remarks delivered in Washington, DC. Sessions directed that task force, as well as Justice Department officials, the FBI, and the Drug Enforcement Administration, to name the top transnational criminal groups threatening the US. Subcommittees within the new task force will focus on the five groups named by those officials. “I have ordered each of these subcommittees to provide me with specific recommendations within 90 days on the best ways to prosecute these groups and ultimately take them off of our streets,” Sessions said. Below, you can see the five groups on which the Justice Department says the new task force will focus. Trump has inveighed against MS-13 throughout his time in office. The gang started among migrants from Central America – El Salvador in particular – who fled civil wars in the 1970s and 1980s. Many of them ended up in Southern California, where, without family networks or other connections, they gravitated toward gangs. Deportations returned many members to their home countries in the 1990s and 2000s, where the gang blossomed in the postconflict environment. The gang’s influence has since spread throughout the region, including to the US, where it often carries out extortion, robberies, and other crimes in areas with large migrant communities, like the Washington suburbs or Suffolk County on Long Island. Though MS-13 members have committed particularly heinous crimes, experts have said the Trump administration misunderstands the reach and power the gang. The Mexican organised-crime group CJNG is the youngest group on the list compiled by the Justice Department. It is believed to have sprung from one faction of the Sinaloa cartel, which is also on the list, around 2010. 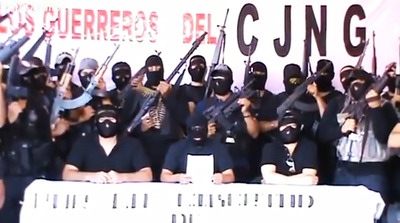 Based in the southwestern state of Jalisco, the CJNG has grown rapidly, expanding throughout the country. It often violently forces out competitors and has corrupted numerous law-enforcement officials. It has focused on synthetic drugs like crystal meth, and it has helped push up homicide rates along Mexico’s Pacific coast, fighting for control of ports needed to bring in precursor chemicals needed to make those drugs. The CJNG has expanded into other criminal enterprises; in some parts of Mexico it is believed to be fighting for a piece of the lucrative oil-theft trade. The group also appears to be facing competition at home. A group called the Nueva Plaza cartel, believed to be led by a one-time confidant of Oseguera, is thought to be challenging it on its home turf in Guadalajara, with backing from groups like the Sinaloa cartel. Over the past two decades, the Sinaloa cartel has risen to the top of Mexico’s narco hierarchy, operating throughout the country and around the world, linking coca fields in South America and drug labs in Mexico to consumers in the US, Europe, and parts of Asia. Formed in the western state of the same name, the Sinaloa cartel emerged in the 1990s after the breakup of the powerful Guadalajara cartel. Led by Joaquín “El Chapo” Guzmán, the Sinaloa cartel muscled rivals out of valuable territories, including cities bordering the US. In the process, the cartel helped stoke dizzying bloodshed in Mexico, making its cities some of the most violent in the world. The cartel’s outlook has been cloudy since Guzmán’s January 2016 arrest, which came about six months after he broke out of prison for the second time. Rumours of a looming third breakout appeared to be snuffed out in January 2017, when Mexican officials whisked him to New York and turned him over to the US. Since then, the Sinaloa cartel appeared ready to crack up. Guzmán’s sons and presumed heirs to the cartel were kidnapped by rivals in late 2016, and in early 2017 they were challenged by Guzmán’s former right-hand man and his son. But Ismael “El Mayo” Zambada, a shadowy cartel chieftain who helped form the group with Guzmán and is backing Guzmán’s sons, appears to have reestablished some of the cartel’s “cohesion” and avoided a major fracture. The Sinaloa cartel is better understood as an alliance of factions rather than a hierarchical cartel – an organizational structure that is believed to give it some resiliency in the face of law-enforcement pressure. With Guzmán absent, the group is believed to have continued operating with a lower profile, led by experienced smugglers like Zambada. A sophisticated narco tunnel – a smuggling method pioneered by the Sinaloans – was recently discovered in Tijuana, where the group is still active despite a challenge from the CJNG. 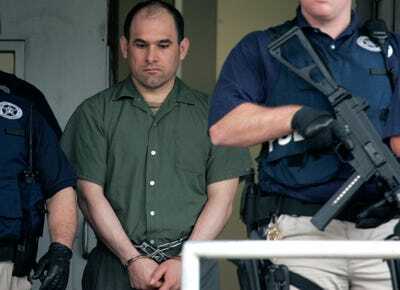 (AP Photo/Pat Sullivan)The Gulf cartel leader Osiel Cárdenas-Guillén leaving the federal courthouse in Houston in 2007 after pleading not guilty to charges connected to running a cartel that at its height smuggled 4 to 6 tons of cocaine a month into the US. The Gulf clan, or the Gulf cartel, was long one of Mexico’s most powerful criminal groups moving cocaine from South America to the US and meting out shocking violence along the way. The Gulf cartel’s formation can be traced to the mid-1980s in northeastern Mexico, where criminal elements and officialdom have long intertwined. Around that time, it began cutting deals with Colombian traffickers and soon vaulted from a relatively small-time marijuana and heroin business to a billion-dollar cocaine-smuggling operation. The cartel also corrupted government officials, federal and local police forces, and attorneys general. In the late 1990s, it also began developing a military wing, recruiting former Mexican special-forces soldiers to help form a group of enforcers known as the Zetas. The cartel, and the Zetas in particular, soon diversified into numerous criminal enterprises and expanded to target non-drug-related businesses and natural resources. The Zetas have also carried out some of Mexico’s most brutal crimes. The Gulf cartel and the Zetas began to split in the late 2000s, sparking inter- and intra-cartel fighting that still makes northeastern Mexico one of the country’s most violent regions. In recent years, the Gulf cartel has “lost strength and has experienced rapid turnover in leadership,” the DEA said in its 2017 National Drug Threat Assessment. But the group remains influential in northeastern Mexico, moving drugs into South Texas and controlling distribution hubs in US cities like Houston and Atlanta. Hezbollah, or the “Party of God,” is the only group on the Justice Department’s list with its origins outside the Western Hemisphere. It emerged after Israel’s 1982 invasion and occupation of southern Lebanon, which came amid the Lebanese civil war that ran from 1975 to 1990. A Shiite Muslim political party and militant group, Hezbollah receives significant support from Iran and has fought with Iran in Syria to support that country’s ruler, Bashar Assad. That campaign has improved Hezbollah’s operational capabilities and added to its weapons stockpiles, now believed to include weapons like guided missiles, armed drones, and anti-tank missiles. Israel has launched strikes in Syria meant to deter Iran and Hezbollah and has increased its readiness to counter Hezbollah and Iranian action there. Hezbollah’s growing role in Lebanon and its expanding military capabilities have led experts to warn a future war between it and Israel could be bigger and more violent that the 2006 Lebanon War. The US, which considers Hezbollah a terrorist organisation, has pushed Lebanon to cut Hezbollah’s access to its financial sector. The group has also been active in the US and the Western Hemisphere for some time, though its focus there is believed to be on money laundering. People in the region with links to the group are almost all considered not to be active members but rather “associates,” though at least one man has been accused of conducting surveillance in the US in support of potential Hezbollah attacks. The US has also accused numerous Venezuelan officials of links to Hezbollah, including through an alleged black-market scheme to sell passports. Some intelligence officials, however, have said those allegations are overstated. Hezbollah-linked actors in the region “have largely been involved in logistics support, providing funds back to Lebanon to Hezbollah itself,” Adm. Kurt Tidd, the head of US Southern Command, told the Senate in early 2016. While the groups named Monday are responsible for violence and criminal activity in the US and elsewhere nearby, experts have differed with the Trump administration’s assessment of them. Former Justice Department officials have told Business Insider that Sessions overstates the influence of and threat posed by MS-13. While the gang’s members have committed heinous acts in the US, their crimes target mostly immigrant communities. Though the group’s members in the US have contact with leaders in Central America, the organisation itself is decentralized and largely involved in crimes like extortion, drug possession, and homicide, as it isn’t powerful or organised enough for transnational drug-trafficking. Mexico’s cartels also have a presence in the US, as the DEA has documented. But what they do in the US appears to be vastly different from what they do in Mexico. “The cartels use gang members. They use individuals that are living here in the United States to basically do the distribution and the logistics here in the United States,” Mike Vigil, a former director of international operations for the DEA, told Business Insider in 2017. Even as violence in Mexican border cities has risen over the past decade, violence in US cities next to them has been below average. And incidents of cartel-related violence in the US have usually been limited to people with ties to the cartels (though there have been cases of mistaken identity). Hezbollah is also active in the US, but it appears largely focused on fraud and money laundering. Throughout the region, the group’s activities appear limited to financial and logistical support for the organisation based in Lebanon. Intelligence officials have also disputed assertions by US politicians that the Venezuelan government is collaborating with Hezbollah and other militant groups. “The whole Hezbollah line has been distorted for political purposes by the more extreme elements of the US right wing,” a former CIA senior official told Reuters earlier this year.